World-leading academics coming together at the University of Sheffield this week to discuss issues in political economies in all settings and all parts of the world. 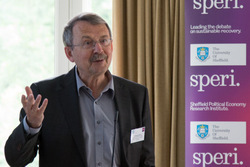 German political economist and sociologist Wolfgang Streeck opened Sheffield’s Political Economy Research Institute’s (SPERI) fourth conference on Monday (July 4, 2016) with a keynote speech discussing capitalism and democracy in Europe arguing that capitalism and democracy no longer work together to create a stable political economy as they did for so long within the post-war settlement. The Emeritus Director of the Max Planck Institute for the Study of Societies in Cologne, Germany is one of eight plenary speakers presenting at the three-day conference being held at the University’s Halifax Hall. SPERI invited papers to be submitted for the conference under the broad theme of ‘Political Economy in an Age of Great Uncertainty’. 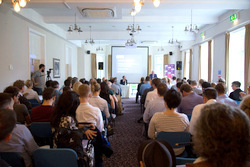 More than 100 academics from across the world are speaking at the event discussing a wide range of issues including austerity, pension policies, the banking crisis and how devolution is changing political economy of the UK through devolution. You can follow the highlights of the conference using the hashtag #SPERI16.